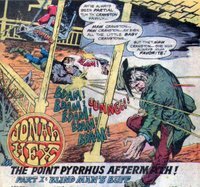 Matching Dragoons: Weird Western Tales #24 "The Point Pyrrhus Aftermath"
Weird Western Tales #24 "The Point Pyrrhus Aftermath"
Taking place two months after the attempt on President Grant's life we find Russ Cranston riding into town, looking for Jonah Hex. Russ finds Jonah lounging in a porch swing at the local Doc's. He draws on Jonah, only to have Jonah get the drop on him while commenting on the entire Cranston clan. When Jonah rolls out of the swing we see that his eyes are bandaged! Local townsfolk gather and start complaining about how many men Jonah has killed since he has been in town and they decide to run him out of town. The Doc tells them that Jonah is gonna be blind for a least another week, they can't turn a blind man out on his own. They decide to send along a traveling actor that has been panhandling in town & amongst the crowd. The Doc tells Jonah to keep the bandages on at least another week or he'll traumatize the optic nerve & may be permanently blind. As they leave town, Jonah tells the actor that two of the Cranston boys will probably come after them so they decide to work out a method of having the actor be Jonah's eyes. They practice for days until they come upon a ferry crossing a river. They put their horses on the ferry and start across. The Cranston boys are hiding up in the hills and shoot both ferrymen. With the actor's help, Jonah returns fire, killing one of the Cranstons, with the other running off. Jonah & the actor now attempt to ferry across the river, but the ferry has drifted in the current and is now heading for some rapids. When the ferry hits some rocks, the actor is tossed overboard. 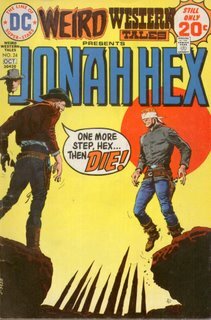 Jonah leaves his guns on the ferry, ties a rope around his waist and jumps into the river to save the actor. Once he reaches the actor and starts pulling himself back, the rope snaps. The horses jump from the ferry and the ferry goes over a waterfall. Jonah manages to grab a horse as it swims by and they are pulled to safety. Now with all of their supplies and weapons gone, except what was in the saddle bags, Jonah & the actor set up camp. The next morning, Jonah starts to remove his bandages and tries to determine what they are going to do about the remaining Cranston, who will obviously be on their trail. The actor mentions that he has a plan. 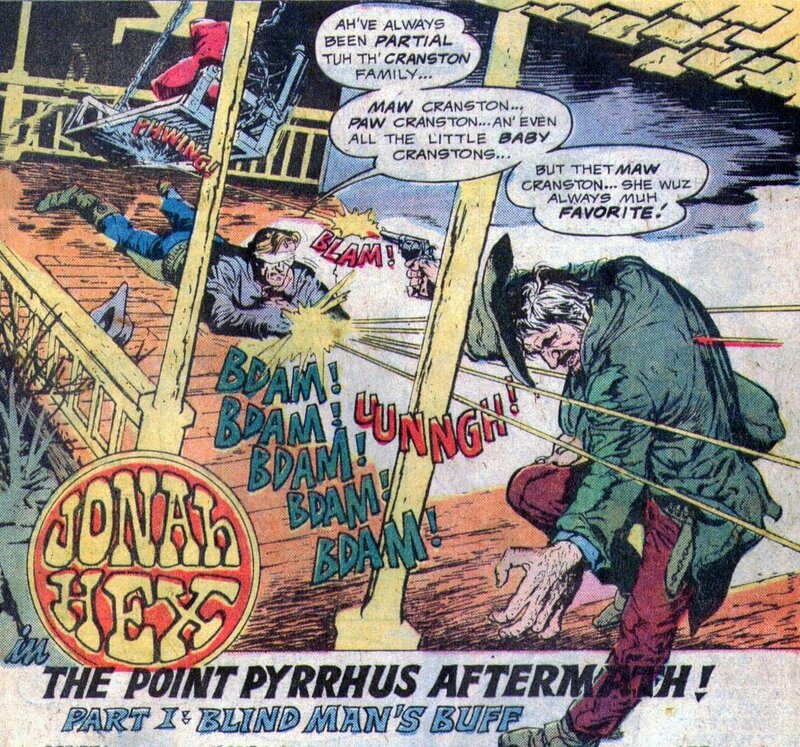 While Jonah's eyes are adjusting to the light, the actor strikes him in the head with a rock. Meanwhile, the last Cranston is waiting for them to leave the valley they are in. Jonah comes riding out and Cranston guns him down. Cranston walks over to the body and finds that the dead man's face is covered with colored grease. Just then Jonah walks out and throws a knife into Cranston's chest. Jonah kneels by the dying actor who impersonated him to distract Cranston. The actor starts quoting Shakespeare, and attempts to tell Jonah what play the quote is from. Jonah stops him and answers that it is from Hamlet. 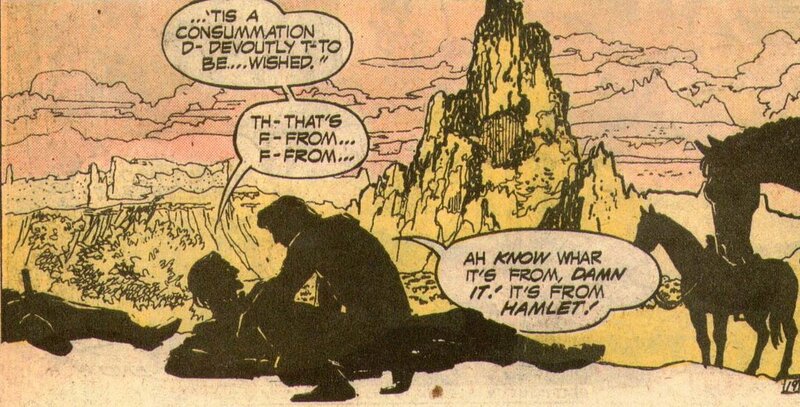 The actor dies and as Jonah rides off, he confesses that when he said Hamlet he was just guessing. And before someone asks, the guy laying off to the left has a knife sticking out of his gut. Gutterminds!!!! I have always enjoyed this issue. Noly's artwork is gritty in all the right places. There are a few panels that look rushed but the panel where the actor is dying, Noly uses silhouette wonderfully as a foreshadowing of the actor's death. I always thought that the cover was weird. If Jonah is blind, why bother having him step on a pit of spikes. Just shoot him. 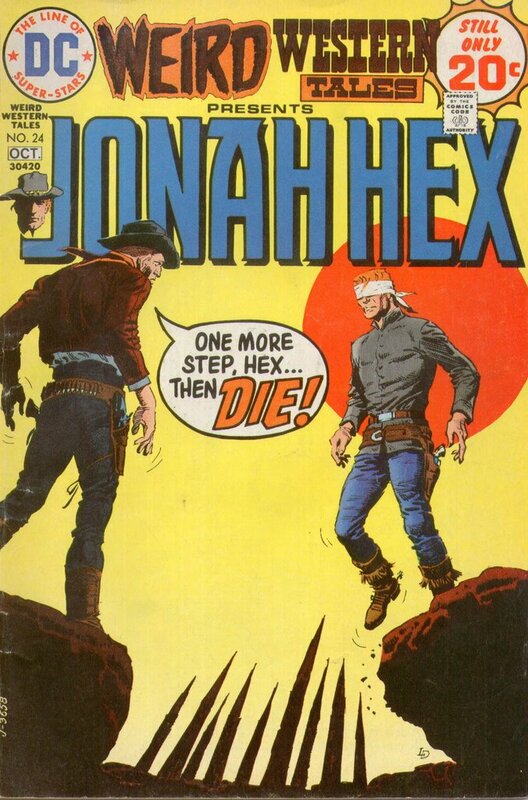 But this is Weird Western and the covers have to be really dramatic. Next issue - tollroads, quicksand, and a hanging. Sounds like a normal day in Oklahoma. Your posts always get me looking around the interweb for historical information. You're probably already familar with it, but I found this interesting little history of the Dragoon. I hadn't looked up the history of the Dragoon. I've been busy looking up the travels of Grant, the shooting of Stonewall Jackson, women's suffrage in Kansas, and time travel. I've never been a gun buff, the the Dragoon stuff was interesting.